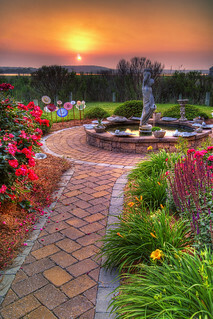 My garden overlooks the Little Assawomen Bay in Fenwick Island Delaware. Before adding the hard-scape and landscaping, this area was covered in noxious weeds; namely phragmities. My husband Ken and I constructed the fountain wall and paver walkways ourselves. We then added the knockout roses and other perennials for color. The garden reflects an 'Old World' style and makes us smile when we spend time there. The hypertufa planters and concrete leaf castings in picture 2 were made by me. The crystal flowers in picture 2 were made with old recycled crystal plates and copper plumbing supplies and just sparkle in the sun. I enjoyed searching my cupboards and resale shops for just the right plates, etc.